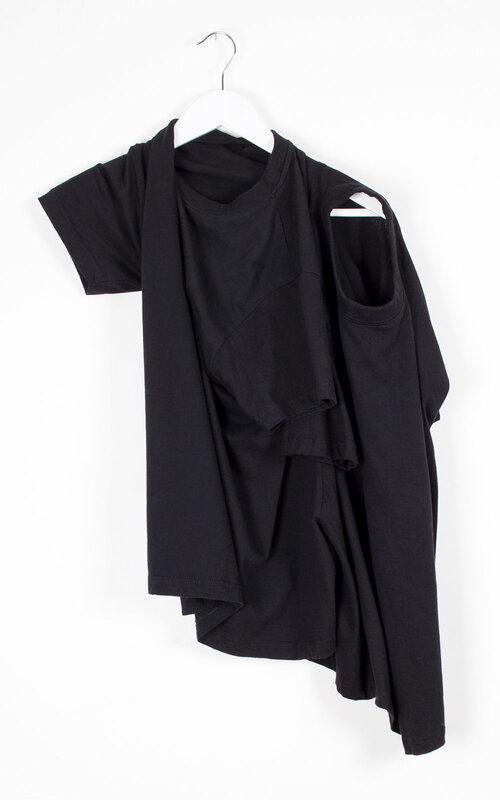 Each T shirt in the combined garment can be worn as lead garment (by choosing different head and arm holes) as the other T adapts to drape around it. Two T shirts cut together so they cannot be separated, only rotated for alternative use of head and arm hole, to create different shapes. Classic stripe City worker’s shirt, given extra collar button/holes and double openings/button/hole stands to allow multiple rotations and possibilities of wear. This person can never work in an office again. Panels from various knit samples collated into wearable conceptual items with inbuilt freedoms of use. 08) Double Open High Polo Cardigan. Multiple rotations. The series is made using 10m each of two end of line remnant print fabrics in Navy/White. 5 styles/sets, designs limited by total fabric available. Dress Jacket with hinged, escapable, sleeves and raw pleated peplum, made from the remnants left after all other dress part had been cut. Skirt outline drawn onto one continuous piece of fabric, folded in half with hole cut for waist. Part unfinished, raw edged and using normally discarded fabric selvedge. Classic short sleeve, soft-tailored dress up-scaled to one size fits all proportion, for universal wear-ability. Dresses are all collapse-able and come in sets with supporting add-ons (sleeves, additional panels). The stages of collapse and interplay of panels and parts allow for multiple variations of wear, giving each dress several identities. Dress drawn onto and cut from one continuous piece of fabric folded in half, with head hole, darts and surface side seams added. Unfinished raw & selvedge edged. Long Sleeves are stitched onto the front surface at sleeve head only, allowing dress to be worn sleevelessly or long sleeved. Dress set includes extra set of high gathered sleeves, based on the shape of a left over skirt panel, allowing it to go through 3 stages of wear/identity. Dress set includes extra Shoulder/Sleeve panel and separate set of long sleeves. 4 part set, allows for 3/4 stages/variations. In a crisis why do we cling to the habitual modes that may have caused the crisis in the first place? Nostalgia for the traditional dress form as touchstone to gender, identity and security. Navy Blue as the Pink of England. Home sewing. Pattern cutting 101: going back to formal basics in order to subvert them. A classic, fitted short sleeve soft-tailored dress with pencil skirt, collapses and twists and is supported by a replica of itself. Divisions and variations thereof. Series made using 10 metres of remnant polyester jersey. 4 Designs, limited by total fabric available.